During twelve consecutive days, I painted the sheets of my bed as they remained after they have been slept in. I had to finish each canvas before bed time and unavoidable change of the wrinkles. At the end of each session, I scratched the day onto the corner of canvas using the handle of the brush while the paint was still wet. After twelve days, it was time to change the sheets. Felix de la Concha ’s work is contemporary insofar as he has aligned a long European method of painting en plein air with and American tradition which is fundamentally based in the technologies of photography and film. His series “Doce días de doce noches” tells an unresolved narrative by cutting from shot to shot, as if it were a movie, but as a sequence of paintings seen as a totality, rather than as an evanescent filmic image, it tells of the continuity and persistence of life. (Mark Francis is former head curator at the Andy Warhol Museum and curator of the Carnegie MOA. And now director of the Gagosian Gallery in London). 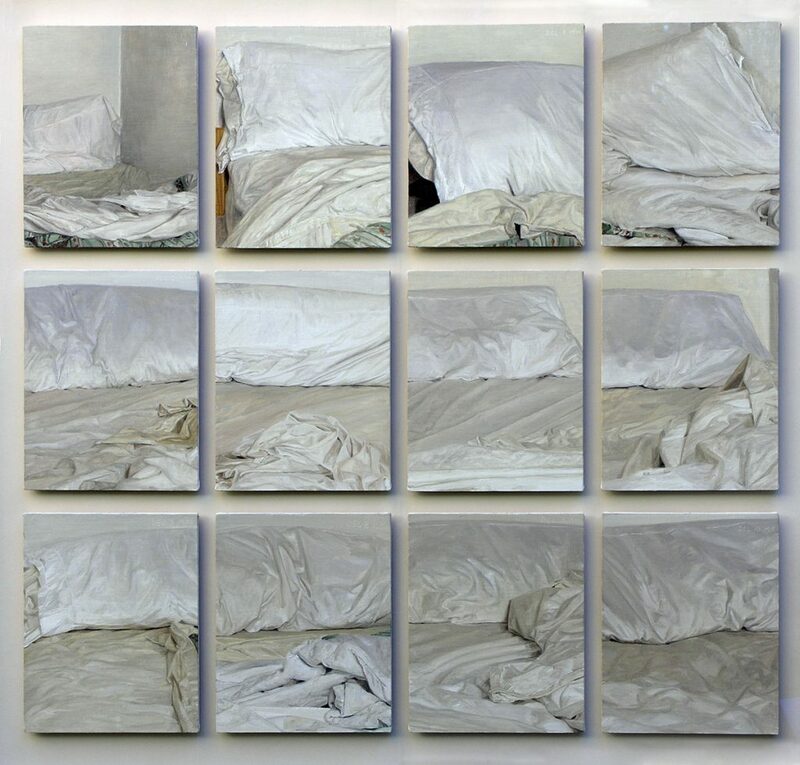 It is a composition that represents the state in which the artist’s bedsheets remained for exactly twelve consecutive nights (November 29th to December 10th, 2002). This time constitutes a cycle; in a most prosaic sense, it is the cycle of the sheets’ use, since he changed them on the thirteenth. The composition’s circular nature connotes the movement of the aesthetic focus from time to space, the space of familiar intimacy with all its traces. This is the essential part of the composition: the representation of the space of familial intimacy. The fact that this intimacy is highlighted by presenting rumpled sheets leads us to laughter, as we will see later through other works. (Luis Beltrán Almería is a literary critic and professor at Universidad de Zaragoza in Spain).